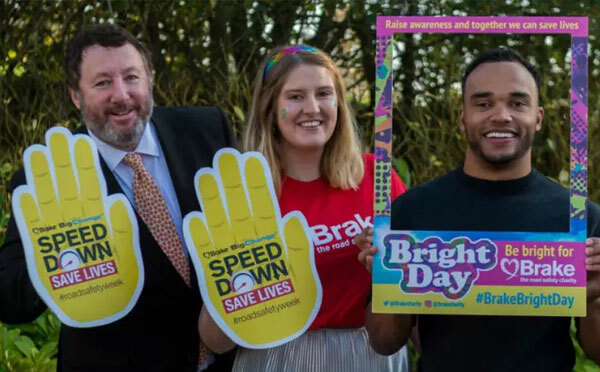 Leeds, UK, 6th November 2017 – Nic Hamilton, brother of the Formula One world champion Lewis Hamilton, was spreading the message that « Speeding is only for the Track » ahead of Road Safety Week later this month. His appearance in the city is in partnership with road safety charity Brake and Leeds based road safety technology business BigChange. At the event at the BigChange headquarters at Temple Point yesterday the 25-year-old talked about speed – and its ability to thrill and also its ability to kill on Britain’s roads. Hamilton’s message on the day was that « speeding is only for the track ». Martin Port, the founder and CEO of Bigchange, one of the fastest growing technology businesses in the UK, also spoke about the firm’s unique in-vehicle technology that helps drivers to understand their driving behaviour better, cutting speed and significantly reducing road deaths. Hamilton was born with cerebral palsy and when he was only 18 months old his parents were told that he would never walk and that his eyesight was extremely poor and would deteriorate as he got older. However, he defied the medical odds and after years of hard work and dedication went from being wheelchair bound to walking unaided by the age of 17. His parents decided to agree to his request to be allowed to race and he was given the opportunity to race in the highly competitive Renault Clio Cup series. In 2015, Nic became the first disabled athlete to compete in the British Touring Car Championship and, with just 20 percent of the UK’s 11m disabled population being involved in sport, he hopes to inspire individuals that pushing yourself regardless of your life situation or industry is possible. This year sees Nic returning to the Renault Clio Cup racing with WDE Motorsport.